Thomas Dudley is one of those perfect ancestors. He is well researched and most of his family are traceable at least a few generations back, especially on his mother's side. In this post I want to tackle the Thorne ancestry of Thomas' mother Susanna Thorne. Susanna was most likely born in Yardley-Hastings; she was baptized on 5 March 1559/60. Her surname was recorded as 'Dorne.' This family, as did many families of that era, had an alias. Today, we think of an alias as a bad thing, something criminals do. But the word alias actually means, "at another time." So, the family name is Thorne, but at another time they went by Dorne. The Thorne/Dorne family can be traced back to Edmund Dorne, Esq. of Northamptonshire. He was born about 1420. We don't really know much about his ancestors. Edmund was never knighted but he was quite successful in life. His name is found in the records of the time, on land deeds and in court cases. Edmund made a very advantageous marriage to the Widow Margaret Billings Lovatt. 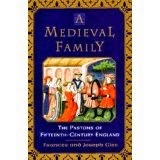 The marriage was most likely arranged by parents or family members, love had little to do with medieval marriage. If you've never read The Paston Letters, I highly recommend it. The letters, written by members of the Paston family in the 15th century, open a window into their world and daily life. This would be the same time period as Edmund and Margaret. Margaret Billings' father was actually mentioned in one of their letters. Margaret was the daughter of Sir. Thomas Billing of Northamptonshire. The ancestry of Sir Thomas is unknown, it is believed that his beginnings were modest. He trained as a lawyer and was a member of Gray's Inn. His career was centered mostly in London and where he fulfilled many important civic duties. including that of Common Sergeant and Under Sheriff. He served as a member of Parliament for both Northamptonshire in 1445 and for London in 1449. As the century progressed the country was convulsed by the tumultuous events now known as the "War of the Roses ." 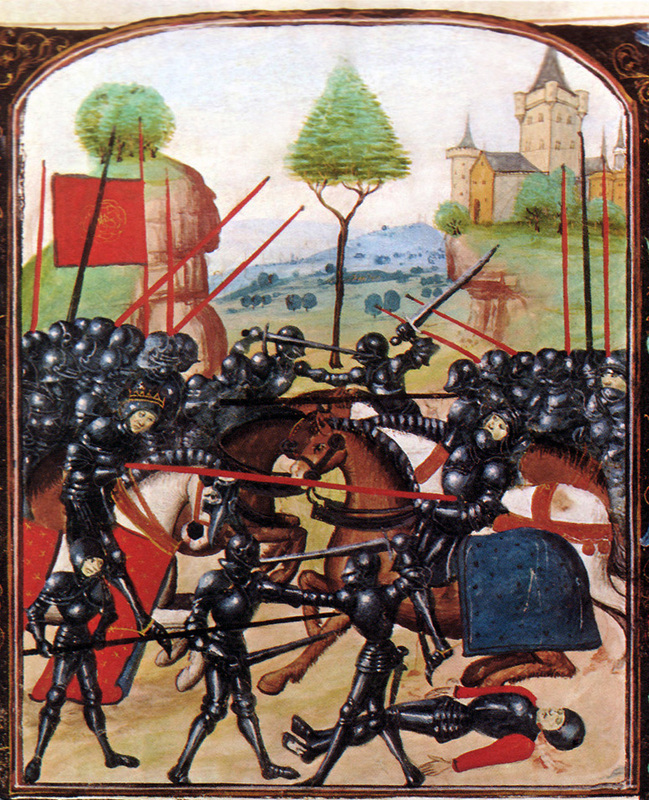 The 'war' was the protracted fight for the English throne between the House of York and the House of Lancaster and it forced many to choose sides. In the early 1450's Thomas Billing was retained as a lawyer for the Lancastrian Queen Margaret of Anjou. In the parliament of 1459 he was one of the crowns legal adviser who drew up the bill of attainder against the rebellious Duke of York. 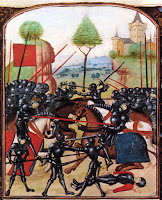 In 1460 a decisive battle was fought at Northampton. The victorious Yorkist had taken up a defensive position at the Delapre Abbey. It is possible that Thomas Billing switched allegiance as he was reappointed King's Sergeant by the new King. Thomas was married twice; his first wife was Katherine Gifford. Their daughter Margaret was born about 1430. Margaret was also married twice. She was first married to Nicholas Lovatt, the son and heir of Thomas Lovatt I. They had one child, a son, who was his grandfather's heir. Thomas Lovatt I was quite wealthy and his grandson became a substantial landowner in Northamptonshire. Edmund and Margaret were married some time before 1455 when they were both named in a land deed from her father in Law, Thomas Lovatt. The land was given to Edmund and Margaret, but would revert to Margaret's son Thomas Lovatt on her death. Margaret and Edmund had at least four children, sons Roger, Thomas, John and William. Thomas and John were mentioned in their half brother's will in 1491. Edmund Dorne of Syresham wrote his will on 30 March 1473, no probate record has been found but his land was transferred to his eldest son Roger on 4 October 1477. He made the usual requests to be buried before the alter of St. Thomas in the church of St. James in Syresham. He left land, tenements, rents, meadows, etc. in three counties. It is not known when Margaret his wife died, she was named in his will so she was still alive in 1473 and she and Edmund executed a deed in 1474, this is the last record they are found in. Alice was the daughter of William Arden of Cottesford and Agnes Stotesby of Evenley. Williams father was identified as Robert Arden of Cottesford. His widow Alice remarried by 1512 to William Woodward. After Thomas' death, Alice remarried to a William Woodward. William was born about 1485, probably at Syresham. He married Alice, possibly Alice Stotesbury before 1515. He wrote his will in 1529 but it was not proved before 1537. The first mention of him in the records is when he was noted to owned suit at the manorial court of Syresham, previously held by his father in 1508. On 22 May 1537 he again owed suit at the manorial court of Syresham whose overload was Magdalen College at Oxford University. But, by then he also owned land in Yardley-Hastings. He seems to be the first of the Thornes with land in that area. In 1531 it was recorded that he was patron of the living at Yardley-Hastings, meaning it was his right to appoint the vicar at the church. In his will, William named his wife Alys, leaving her 'certain lands'. All his Copyhold lands in Yardley and in Syresham he left to his son Thomas. Thomas was born about 1521 based on the birth of his children. When he wrote his will in 1588 he made his home in Yardley-Hastings. He married Mary Purefoy by about 1550. He and Mary were the parents of Susanna Thorne, wife to Roger Dudley and mother to Thomas Dudley. Brandon, Fradd, "Ancestry of Thomas Thorne, Granfather of Thomas Dudley," The Genealogist vol 19 no 1 (Spring 2005). Nigel Ramsey, "Sir Thomas Billing," Oxford Dictionary of National Biography (www.oxforddnb.com : accessed 28 April 2016). Fradd, "Ancestry of Thomas Thorne". Charlotte Carmichael Stopes, "The Warwickshire Ardens," The Genealogical Magazine Vol. 2 (1899) 154, digital images, Google Books (https://www.books.google.org : accessed 1 May 2016). William Harvey, John Philipot, William Ryley, The Visitations of the County of Oxford Taken in the Years 1566, (London: publisher not noted, 1871) 207, digital images, Google Books (https://www.books.google.org : accessed 1 May 2016).